What attracted people to Watford? From its origins as a one-street market town, we trace why people came to live here. It is hard to imagine now, but Watford was originally a predominantly rural, agricultural area. It consisted of one street, the High Street, with houses joined to one another in a long line. 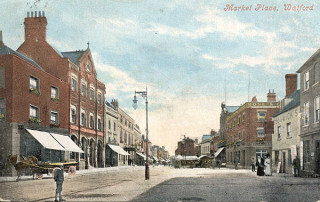 It was a market town, supplying mainly agricultural produce for the London food market. The total population at the time of James I was 500-600. 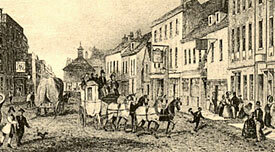 Modern Watford was formed by the opening of the railway in 1837. The old village life began to disappear and new roads opened, bringing trade, new building and an influx of new residents. The railway linked London with the industrial centre of Birmingham. This led to a sudden and noticeable increase in traders in Watford. By 1878 there were eight printing firms, three breweries and four coach builders. Watford’s population rose from 2,960 in 1831 to 29,327 in 1901. Some housing conditions were appalling, with no form of sanitation or amenities. This accomodation was built after the arrival of the railways to house those workers coming into Watford in the wake of the rapid industrialisation of the town. The railway became the major employer in the town. Businesses were attracted to the town because of the good rail connections. Many houses had to be built for the ‘navvies’ working on the railway, notably Ballards Buildings, next to St Mary’s Church. By the 1800s, nearly 1500 men were employed by the railway. 500 of these had homes in Watford. The Nascott Wood area estate north and west of Langley Road was developed in the 1850s near the railway, as householders were offered preferential rates of travel if they commuted to London. In the 1870s and 80s the business and professional classes moved to the suburbs and travelled to and from London daily to pursue their livelihoods. The prospect of escaping from the smoke, smells, grime and sulphur laden fogs into the green fields, orchards and wooded countryside of Watford made it a desirable place to live and set up business for Londoners. The new industries, roads, market, housing, factories, schools, churches and excellent rail facilities in a clean-air environment, made Watford an exciting and appealing place to live and work. This page was added on 17/08/2011. bought fish & Chips there when we lived in St james’s road !!! Fascinating page. Very informative. My Ashby’s ancestors, distant relatives are from Watford. My grandad had his own painting and decorating business, F. W. Withey & Sons in Harwoods Road, Watford, near the football ground, he was also a director of Watford football club & a high profile member of The Oddfellows. My gran Elizabeth Milner moved from London to Watford, ( not sure when but before 1953 ) Southwold Road and worked at the De-beukelaers’s biscuit factory behind our house, where my mother, ( her daughter ) told me gran was the lady who invented, came up with the Idea for the walnut on top of the walnut whip chocolate bar,( I assume they were made from there, ) so the family story goes. Very interesting stuff, unravelling Watford’s past – a fascinating read. Born in Watford 1953 lived their until the mid seventies, moved away until I visited trecenty, what a change… need a passport to enter ! My family ran a number of businesses around Watford during the 1890’s until fairly recently. They had a main shop and house at 197 High St (opposite the present Museum, which was Benskins Brewery) and shops in Vicarage Rd. They were fish and chip shops.